If Joey Chestnut can down 66 hot dogs and 12 minutes in front of a global TV audience, shouldn't the world's best grocery bagger gain similar fame and fortune? 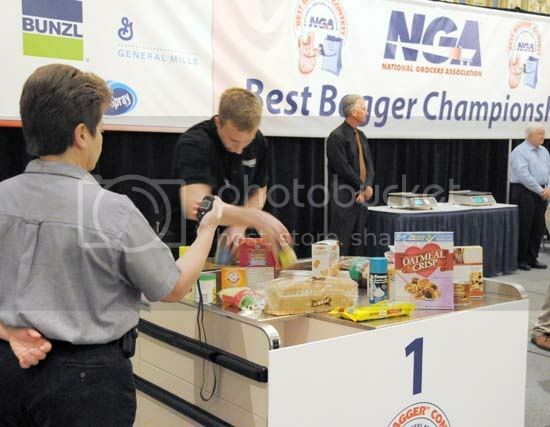 ConAgra Foods will sponsor the 24th annual National Grocers Association Best Bagger Championship to be held Feb. 11, 2010, at the Paris Las Vegas Hotel in Las Vegas, and as a result of the sponsorship there will be higher stakes on the checkout table. The Best Bagger Championship is a year-long, nationwide program in which the best-of-the-best grocery baggers in the country compete for cash prizes and the title of America's Best Bagger. Contestants are judged on speed, bag-building technique, weight distribution between bags, style, attitude and appearance. This year, the winning bagger will receive a grand prize of $10,000, the second place contestant will earn $5,000 and third through fifth place winners will receive $1,000 each. Best Bagger 2010 also features a new logo that will be displayed on new, reusable bags contestants will fill as they race against time and display their bagging technique. The environmentally friendly bags replace paper and plastic bags used in previous contests. "N.G.A. looks forward to teaming up with ConAgra Foods for the National Best Bagger Championship," said Frank DiPasquale, executive vice president, N.G.A. "This new partnership will enable N.G.A. and our members to further promote a long-standing program that represents an important element in providing outstanding customer service in an area where independent community-focused retailers excel." 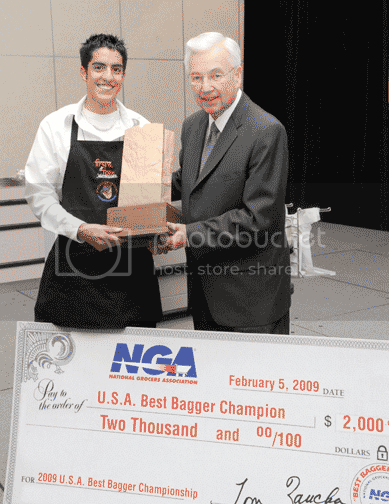 The NGA says: "The Best Bagger contest has showcased the importance of supermarket customer service for 24 years by creating excitement and enthusiasm for bagging." "We think this is a perfect partnership for us, because millions of ConAgra Foods products are bagged at supermarkets across America each day, and many of our customers are N.G.A. members," said Teresa Paulsen, vice president of Corporate Communication, ConAgra Foods. "Whether it's Hunt's, Chef Boyardee, Healthy Choice, Orville Redenbacher's or one of our other famous brands, a ConAgra Foods product is likely to be in the bag, and we want to strengthen the connection between our company name and the food people love." This is a classic case of a major brand finding a clever diamond in the rough property at a fraction of the cost of most rights fees, not only providing cash, but it's brand clout to create value for both property and sponsor. Like Nathan's and the International Hot Dog Eating Contest, could The Best Bagger Championships be ConAgra's diamond in the rough?